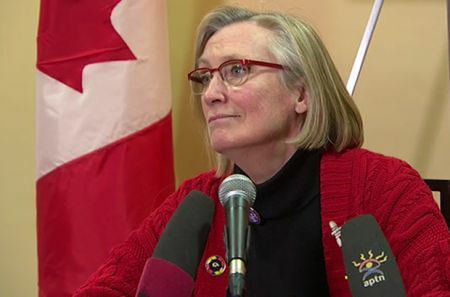 Minister of Indigenous and Northern Affairs Carolyn Bennett. The BC treaty process may be rank with fraud, conflict of interest, nepotism, judicial indifference and spending public money on buying ratification votes, but, as we have seen in recent grand-standing, Canadian politicians love it, legislate it, and lie about it on the world stage. Sliammon people voted ‘no’ to the Agreement in Principle their negotiators presented, in the BC treaty process, in 2001. This spring the completed treaty came into effect. Fifteen years ago, the well-paid treaty negotiators managed to find a way to keep their jobs, to keep the treaty process going, in spite of overwhelming opposition to the process and that vote which should have stopped it. After11 years of ignoring petitions and complaints and questions, the negotiators simply produced a Final Agreement and put it to a vote in 2012. As the date for the ratification vote came nearer, the official “Enrollment Committee” provided Sliammon membership to a number of people who had no right to it - for example, to friends of their families - but who would vote ‘yes’ to the treaty because a cash bonus was promised to the membership if the treaty was ratified by a majority vote. Suspecting that their elected Council and their negotiators had made sure of ratification of the Final Agreement, and aware that the measures taken were totally illegal, the majority “Sliammon Anti-Treaty Group” blockaded the polling station doors with their cars to prevent the ratification vote from taking place. Eventually, with help from the RCMP at the polling stations, the treaty team successfully completed their vote and the Sliammon Final Agreement appeared to have been duly ratified a few weeks later. The Anti-Treaty Group took the matter to court, again, after the vote. It had been discovered that the treaty team and/or the Enrollment Committee had filled out ballots that were printed in the names of Sliammon people who were deceased. The dead people had all voted in favour of the treaty. Dead peoples’ names were printed on ballots, and the dead people voted in favour of the Tla’amin Final Agreement. This modern day treaty has since been made Canadian law by Parliament. - Minister of Indigenous and Northern Affairs, Carolyn Bennett, addressing the United Nations Permanent Forum on Indigenous Issues, May 11, 2016, re-iterating Canada’s “support” for the UN Declaration on the Rights of Indigenous Peoples. In spite of critical – and morbid - failures of accountability and proper procedure, the Tla’amin (Sliammon) Final Agreement was made Canadian law by a ceremony in Ottawa on Parliament Hill on April 10. The ceremony was held while all the flags were at half-mast and the rest of the buildings were empty – out of respect for the passing of Minister James Flaherty. Sliammon people were opposed to the Final Agreement for very clear and meaningful reasons. They wrote their opposition in letters, had hundreds of members sign petitions, and spoke out and voted in official meetings – but neither were their concerns allayed nor was the Final Agreement in any way changed or improved. In 1992, the In-SHUCK-ch Treaty Society was formed and began a process of negotiating a Final Agreement with Canada and British Columbia. The proposal they brought back to the four communities they represented was so unattractive that the first community got themselves out of it within a couple of years; the second community got out of it in 2010; the third community voted itself out repeatedly but has not been able to stop the negotiations team from borrowing money to keep negotiating; and the fourth community enjoys the Indian Act’s prescription of “custom governance” – where apparently very little community involvement or approval is required indeed. Significant opposition arises in the third community, which finally studied the BC Treaty Commission’s rules of procedure for themselves and found that they were supposed to have a vote each year to approve continuation of loans from the government to pay their treaty negotiators and expenses. In 2008, they demanded this vote be convened so they could demonstrate their position and refuse the continuation of the loans. To date, this vote – a necessary condition for participation, according to the BC Treaty Commission – has not happened. Recently a copy of the make-shift Band Council Resolution to approve the renewal of loan funding was leaked to the press. It was also sent to an Early Warning Committee meeting of the UN Committee for the Elimination of Racial Discrimination. The CERD Committee has severely criticized the BC treaty process during formal reviews of Canada since at least 2006. And… any Band Council Resolution is really supposed to be the formalization of a community vote. The British Columbia Treaty Commissioners oversee an elaborate process that all smells as bad as those ballots the poor, dead Sliammon souls used to ratify their people’s release of their lands and rights to Canada. In this state-financed scheme, there is no accountability to community members in the case of a runaway negotiating team (Luuxhon v. The Queen, 1999, SCBC). BC judges refuse to grant injunctions against Final Ratification votes, after years of failed attempts to introduce and resolve conflicts within the treaty process, on the basis that they are ”too late” (Cook v. The Ministry of Aboriginal Affairs and Reconciliation, 2007, BCSC). In the Final Agreement ratification chapter (which is virtually identical for every negotiating First Nation), there is no procedure to implement a “no” vote – except to hold a re-vote. But why do community members try to get out? Reasons are diverse and extensive. Some don’t want to give up tax-free status On-Reserve. Some don’t want to join Canada on Canada’s conditions and fall under Canadian jurisdiction – causing the release of tax-free status. Most people report that the treaty negotiators refuse to answer basic questions about what the treaty will really mean for their community, their lands, and their rights; instead providing boat trips for youth and community concerts, and buying cheerleading speeches by local favourites and business leaders. Some reject the amount of money they would receive for relinquishing their lands to Canada and BC: they give up 95-97.3% of their lands and are compensated at a rate of between $4 and $200 per hectare. That is the range within which each “modern day treaty” completed in BC has fallen. If other factors like ‘lost opportunity costs’ were calculated, the Final Agreements would be seen to be completed at a loss. Communities like Yale, in the steep and arid Fraser Canyon, were prepared to accept $4/ha and Tsawwassen First Nation got about $200/ha for their traditional territory – which includes some prime coastline and a chunk of Georgia Strait, also most of White Rock and South Surrey. Still others cannot accept the universal requirement that they “release and indemnify … Canada, British Columbia, and anyone else” for all past harms. Inadequate fishing rights, release of rights of self-determination (e.g., “to freely determine their political status”), release of rights to consent to development in the traditional territory – these add to an even longer list of concessions demanded by BC and Canada. Blockades again interrupted a scheduled ratification vote earlier this year. 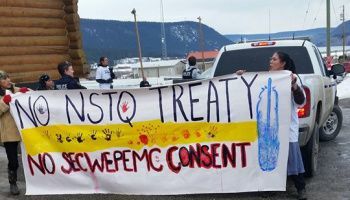 The Northern Secwepemc Treaty Society has carried on with developing their treaty, while southern Secwepemc (there are 17 Secwepemc communities today) have been sending delegations, for years, to ask them to hold off. At issue is the fact that the Northern communities are not the only Secwepemc with interests in the lands they are planning to sell. The Northern Secwepemc area is economically depressed, to say the least. Around Williams Lake, and then further and further west into the largely uninhabited Cariboo region, there is not much work. And the deer and moose are scarce these days, and so are the salmon. Treaty negotiating loans to the communities are worth the equivalent of about 30% of those communities’ fixed annual federal stipends, providing employment and training. But if you take loan money, you have to show progress. On February 11, the vote to approve an Agreement in Principle was interrupted by protesters. In May, that Band Office was occupied by people opposed to the “treaty” and convinced of corruption in the use of the loan funding. In yet another case of wilful blindness, BC Treaty Commissioners have not interrupted the Northern Secwepemc progress although the “overlap” area involved in the lands they are negotiating is a clear and loud and serious one. It is part of the Commission’s mandate to ensure that no treaty group hold a vote on an Agreement in Principle, nor proceed any further, until any conflict over lands covered by that Agreement are resolved. The southern Secwepemc claim to land-based rights in the area is extensive and obvious – and they certainly have not figured out the social and governance dilemma of how their nation will hang together when part of them live under a Final Agreement and the other part does not. But then, every single First Nation which has reached the Agreement in Principle stage of negotiations has continued on in spite of lack of resolution in conflicts over shared areas. And none of the five legal actions in response have been successful. The modern day treaty process is not now, nor has it ever been, nor is it on the point of changing to become, a rights-based process. Across Canada the Liberal government is pushing ahead to complete agreements which hinge on Indigenous poverty and desperation - and very short term very small financial incentives - and not on such provisions made in the UN Declaration on the Rights of Indigenous Peoples as self-determination, ownership of traditional lands and the right not to be assimilated. The gap between what Canadian politicians say is happening in the state’s relations with Indigenous Peoples and what the Canadian state is doing to Indigenous Peoples has probably never been wider. Unfortunately, they are not alone in this. As Bennett and Wilson-Raybould enjoyed their cameo performances at UN headquarters, and loud applause to their waxen and misleading words, Canada was just a month away from going along with ratification of the American Declaration on the Rights of Indigenous Peoples. That Declaration is a regional document coming through the Inter-American Commission on Human Rights, a body of the Organization of American States. The last meeting to reach consensus on that Declaration, 17 years in the making with Indigenous participation and approvals, was held one year ago. At that time, one of the member states proposed that the text of the Declaration which affirmed Indigenous Peoples’ rights to ownership of their traditional territories (an article which can be found in the UNDRIP), be swapped for text that describes only Indigenous Peoples’ right to be consulted, and fairly compensated once the desired extractive industries have had their way on those lands. Indigenous Peoples’ representatives stood up and walked out of the meeting room. They have never returned. The American Declaration was approved in their absence. Canada is not alone – it is leading and the world is following. Letter from Elder Mother of Sliammon regarding sabotage of elected officials critical of new treaty. Description of many irregularities in Sliammon Final Agreement ratification.